Location: 10th St. and L St., Sacramento, Calif.
Huey P. Newton discovered a law that allowed California residents to carry loaded weapons in public as long as they weren't concealed. Legislator Don Mumford introduced a bill, dubbed the "Panther Bill" by the media, to repeal the law. 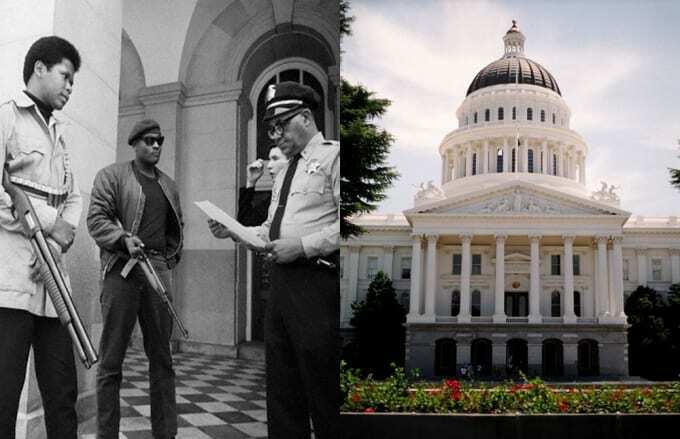 Self-defense was one of the Black Panther Party's main beliefs, and so on May 2, 1967, they brought a fully-loaded agenda to the front door of the California State Capitol in Sacramento. With loaded rifles and shotguns on full display, they planned to read Executive Mandate Number 1 (a response to Mumford's bill) but were forced out of the Assembly Chamber. They improvised, reading the mandate on the lawn. Because of its architecture and impact on the state's history, the Capitol joined the National Register of Historic Places in 1973, and became a California Historical Landmark the following year.